Home / Come, Boycott Israel! 1 – Update on Paul Larudee – we will have our day in court! Updated 8th June: Today an Israeli administrative court issued an injunction preventing the deportation of Paul Larudee, a 60-year-old piano tuner from El Cerrito, until a final decision on his case. A hearing date will be set for the near future. 7th June: President Willie Madisha, the head of the Congress of South African Trade Unions (COSATU) yesterday issued an open letter in support of the Canadian CUPE’s recent unanimous resolution to support the international campaign of boycott, divestment and sanctions against Israel. As someone who lived in apartheid South Africa and who has visited Palestine I say with confidence that Israel is an apartheid state. In fact, I believe that some of the atrocities committed against the Palestinians pale in comparison to those committed by the erstwhile apartheid regime in South Africa. Sweden has started to note that wines produced in the Golan Heights originate in “Israel, occupied Syrian land,” the Golan Heights Winery has informed the Israeli Embassy in Sweden. Winery sources told Ha’aretz that the step is unprecedented and worrisome. The embassy is investigating claims that the warning is being issued for several wines on the Web site of the Swedish government’s chain of shops that sell wine. The chain is the only Swedish body permitted to market alcoholic beverages. 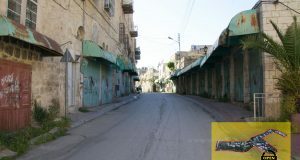 The apartment belonging to the International Solidarity Movement (ISM) in Balata refugee camp, Nablus was broken into by the Israeli military last week, May 31st. In what is an apparent act of vandalism and harassment, the military forced their way into the empty apartment and destroyed many things. 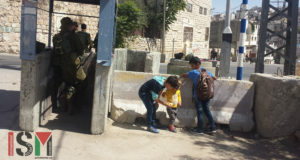 The IOF regularly enters Balata refugee camp and conducts operations, arresting people, often children, and indiscriminately destroying property. They often occupy houses, herding the family into one room and setting up snipers in the house or on the roof. It is not clear why they entered the ISM apartment, but it is not uncommon treatment in Balata. 9th June: Tonight at about 10pm seven Israeli soldiers came to our apartment and knocked on the door. They wanted to come in, and I told them no, they couldn’t. They asked why, I told them that we do not allow guns in our home and that if they wanted to come in, they’d have to leave their guns outside. It happens almost every day in Hebron. Human Rights Workers (HRWs) from different countries come to do what the Israeli security forces refuse to do. They provide security in a nonviolent manner for Palestinian schoolchildren on their way to school and back. They attempt to protect them from attacks by settler children and teenagers. For example, on the 27th May 2006 it was reported that “youngsters from the settlement in Tel Rumeida spat on, hit and threw stones at HRWs from Canada, Denmark and Sweden on three separate occasions, as the HRWs were accompanying Palestinian children. Adult settlers encouraged the youngsters in their criminal acts. 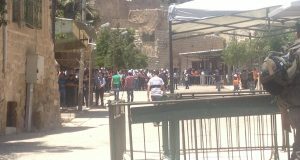 Soldiers and policemen who were present at these events refused to intervene to stop the violence on the part of the settlers. On Saturdays, the attacks are the heaviest, and a number of HRWs have been injured and sent to hospital as a result of the attacks by young settlers. Original Hebrew in Ma’ariv, 4th June 2006 – translation by Rann. Posters to the Taglit Web site enthuse about the birthright trip as a life-changing experience that showed them the “gift of being Jewish” and led them to conclude, as one trip alumini writes, “Wherever I stand, I stand with Israel.” They speak of the emotional charge and the effects on young Americans just beginning to define their own identity; for many, it is their first trip abroad. Gaza strip, engaging in media work, staying with families whose homes were threatened with demolition, and teaching English to high school students. exploiting this money to promote an agenda which is not the agenda of the people who funded Taglit,” says Mark. Potential candidates who are discovered to have a “hidden agenda” are not allowed onto the trips.